The occupants were principally women, with a few old men; the young men had all gone out hunting the sea otter, in the Russian service. Those at home …were all employed in making water-proof garments from the entrails of sea-lions, for their husbands and sweethearts. We bought of then a number of articles of their manufacture…and paid them in tobacco and beads. 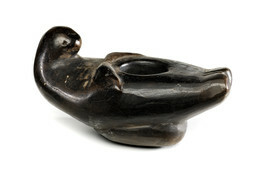 This Sugpiaq pipe represents a sea otter floating on its back, a common sight in the Prince William Sound region where it was made. The pipe is sandstone, blackened by use and age. Russian fur traders brought tobacco to the Sugpiaq region in the 18th-19th centuries, using the leaf as a form of payment to the men and women they forced to hunt sea otters and work for the Russian-American Company. The pipe may symbolize this exchange.